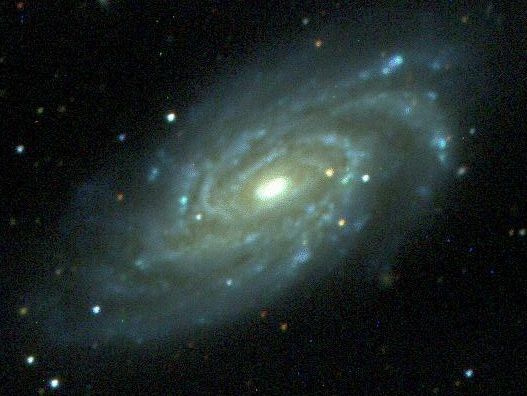 Explanation: The graceful spiral galaxy NGC 6070, 100 million light-years distant in the constellation Serpens, is helping astronomers celebrate "First Light" (the first test sky images) for an exciting new telescope built to perform the ambitious Sloan Digital Sky Survey. The dedicated survey instrument, located at Apache Point Observatory in Sunspot, New Mexico, USA, will map 1/4 of the entire sky in unprecedented detail with sophisticated digital imaging and data processing technologies. Telescopic observations tend to offer sensitive views of only very small pieces of the universe. Interpreting the results is a bit like watching a baseball game through a a drinking straw and trying to figure out what's going on! But scanning the sky over five years of planned operation, the Sloan Digital Sky Survey will build up a multi-color, 3-dimensional view of a large portion of the visible universe. At the turn of the millennium, this "big picture" will give humanity a critical new and detailed field guide to the cosmos.